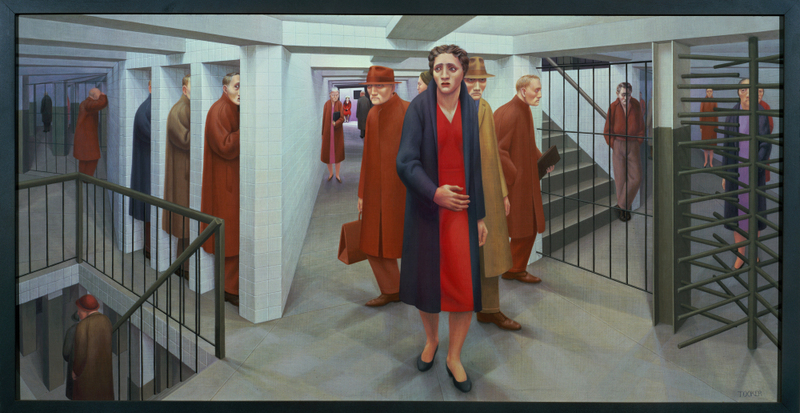 The Art Of Anxiety: Painter George Tooker Dies At 90 Tooker used luminous colors and light to illustrate how people should act toward one another — and painted the consequences of what happens when they don't. The enigmatic artist, who was awarded the National Medal of the Arts in 2007, died of kidney failure at his home in Hartland, Vt., last Sunday. Pennsylvania Academy of the Fine Arts, Philadelphia, Penn. Artist George Tooker, who was awarded the National Medal of the Arts in 2007, died of kidney failure at his home in Hartland, Vt., last Sunday. He was 90 years old. Tooker used luminous colors and light to illustrate how people should act toward one another — and painted the consequences of what happens when they don't. 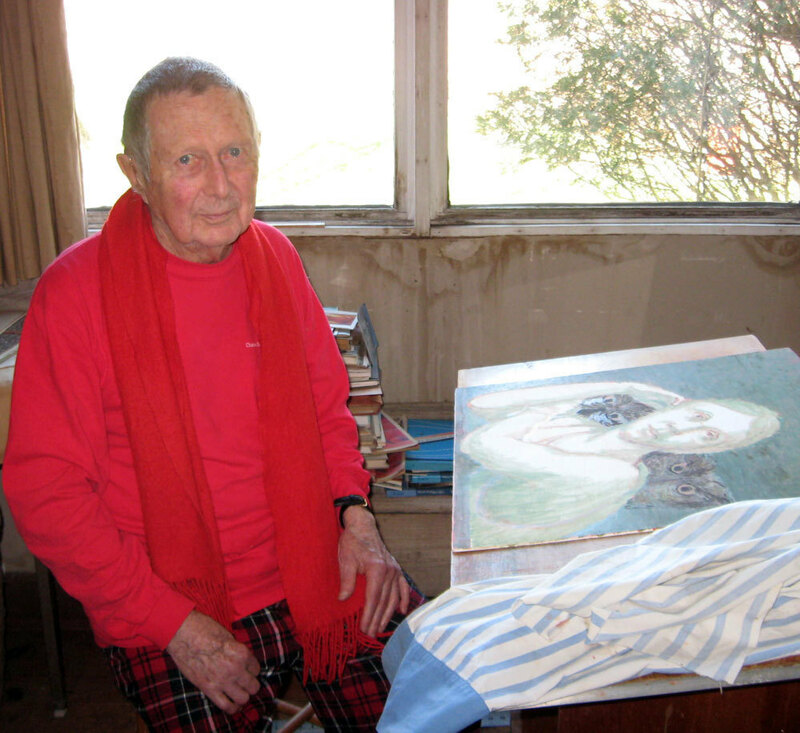 Tooker, pictured in his studio in 2009, painted right up until the end of his life. 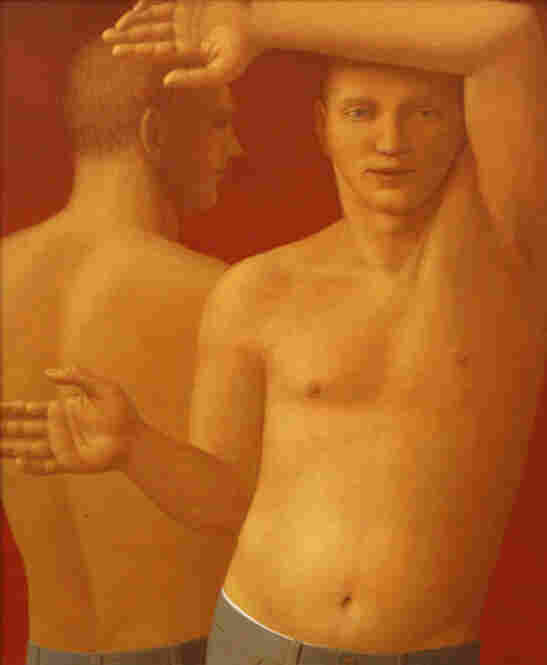 In 1946, near the start of his career, Tooker painted Children and Spastics. The work shows a group of boys menacing a trio of gay men. It's "one of the cruelest paintings" Tooker made, says art historian Robert Cozzolino. The artist was commenting on "things that he had witnessed or what he had felt people were capable of." Tooker channels Michaelango's The Torment of Saint Anthony with a Renaissance technique that comes in part from using egg tempera paints — a painstaking technique favored by the early masters. 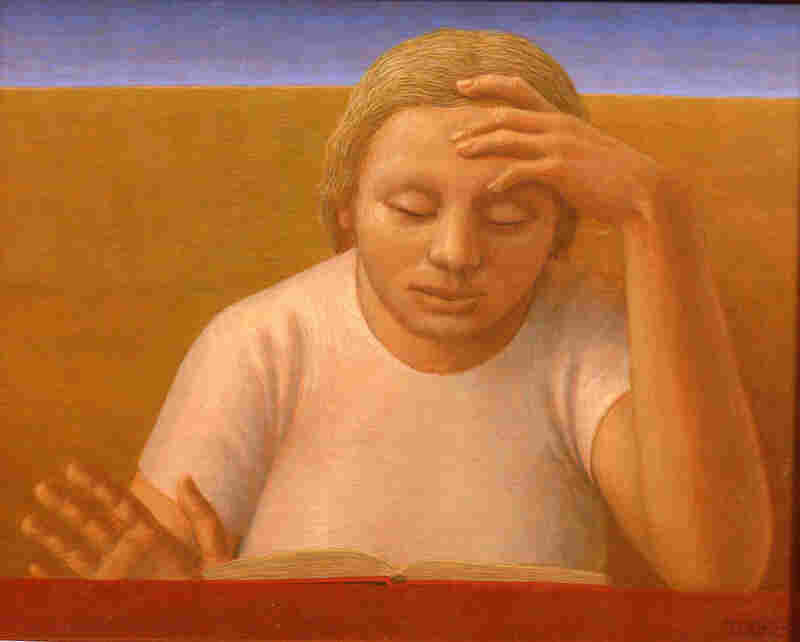 "It's a very old way of painting," Tooker explained in a 2009 interview at his Vermont studio. His piercing blue eyes sparkled as he reflected on a career that spanned 60 years. "People think it's difficult but it's not, it's very easy. But it's slow and the slowness fits me — fits my way of thinking," he said with a laugh. Cozzolino, who is curator of modern art at the Pennsylvania Academy of the Fine Arts in Philadelphia, says throughout Tooker's career, his paintings oscillated between images of paradise and purgatory. "What George is doing is really giving us something to meditate on," Cozzolino says. "Giving us pictures that you're not supposed to get in a couple seconds and then walk by, but you're really supposed to reflect on and start noticing the nuances and implications of what's shown." For instance, in his 1950 painting Subway — perhaps his best-known work — Tooker portrays with creepy precision the angst and isolation of urban life. In that painting, a woman in a red dress walks nervously through a crowded subway station and the viewer is left to wonder what lurks around every corner. His 1956 painting, Government Bureau, shows a softly glowing waiting room while pairs of eyes peer suspiciously through holes in teller-like windows. Tooker's art poked at big government and the Cold War. He took a slap at racism with loving portraits of mixed-race couples. 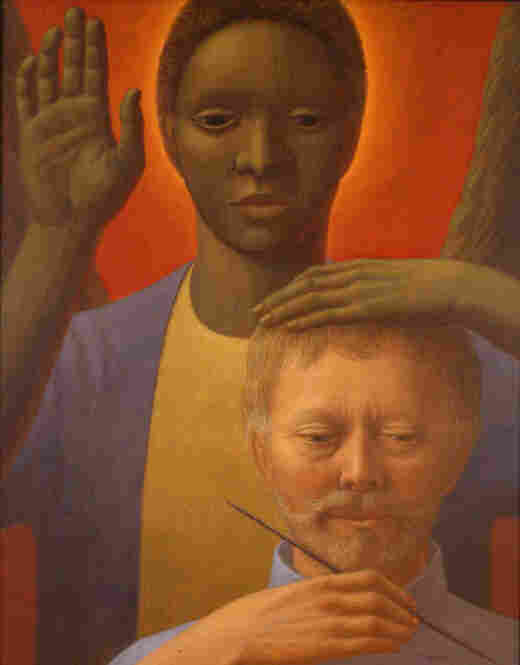 "I wanted to paint positive pictures about integration," Tooker said. "And I didn't like the subway. I think it's obvious I didn't like ... a lot of things about living in the city." Tooker was raised on Long Island. He studied literature at Harvard to please his parents, but he said he always wanted to paint. In the late 1950s, he left New York for Vermont. Over the course of his long career, he created fewer than 155 paintings. Cozzolino says Tooker's crisp, realistic style put him at odds with some of his better-known contemporaries. I don't want too much attention. I never really wanted to be part of the New York scene. "I think in the 1950s ... what was being considered modern and progressive painting — usually was shorthand for abstraction," Cozzolino says. "People like George Tooker, or his close friends like Paul Cadmus, found that they were not treated like superstars or not treated like forward-thinking artists; they were treated like remnants of the past." 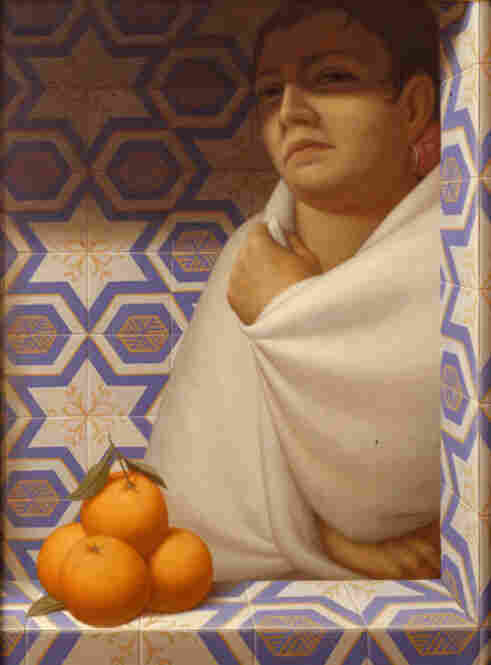 Today, Tooker is widely respected in the art world. After the death of his longtime partner, Tooker's work became decidedly more spiritual. He said he preferred to live alone, close to nature with his dogs. And he didn't care that he never became a household name like Jackson Pollack. "I don't regret that," he said. "I don't want too much attention. I never really wanted to be part of the New York scene." 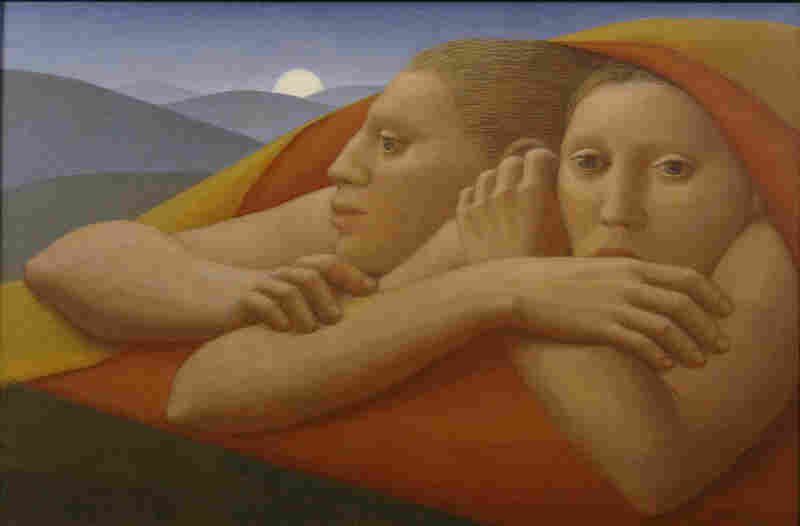 Tooker said he was just grateful that people still bought his work. That allowed him to live quietly in the country and paint what mattered to him — something he did almost to the end.